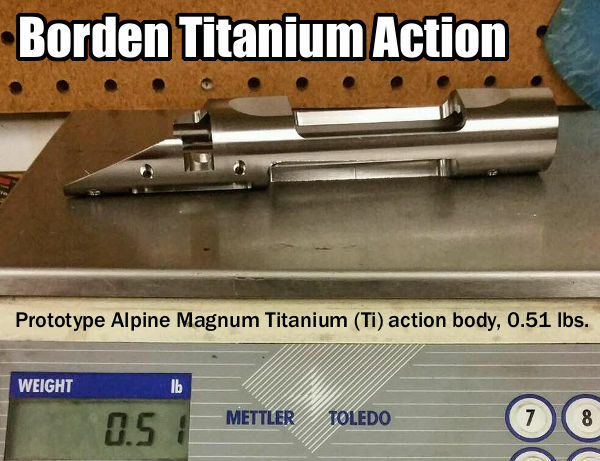 Jim provided this photo of a prototype Alpine Magnum Titanium action body on the scale. Note it is just a bit over one-half pound without bolt. That’s light-weight. Jim said he will “send bolt body, action body, recoil lug, bolt stop and bolt shroud for PVD treatment next week”. Jim hopes to be shooting the finished prototype Titanium Alpine action in two weeks. AccurateShooter.com will provide a full report on the Borden Titanium actions when they reach final production stage. The reduced weight benefits game hunters who have to carry their rifles far afield all day long. We also like the idea of a Titanium action in a small-caliber, carry-around varmint rifle. With a low-recoiling cartridge such as the 20 Vartarg or .223 Remington, it makes sense to have a light-weight rifle that’s easy to pick up and move around. Share the post "Titanium Actions Coming Soon from Borden Accuracy"
One of our Forum members asked us the question: “Does anybody make a good range box with cradles for cleaning at the bench?” The answer is yes — the MTM model RBMC Range Box offers slide-in plastic cradles that provide a reasonably sturdy platform for a quick clean when you’re done shooting. 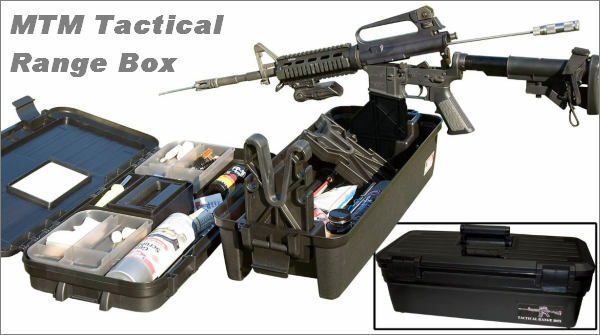 The RBMC box also offers plenty of storage for jags, brushes, solvents, ammo boxes and other miscellaneous gear you need for the range. Among the many range boxes available, the MTM model RBMC Range Box leads the pack in terms of versatility. It is rugged, it has plenty of storage space, and it doubles as a handy cleaning station. 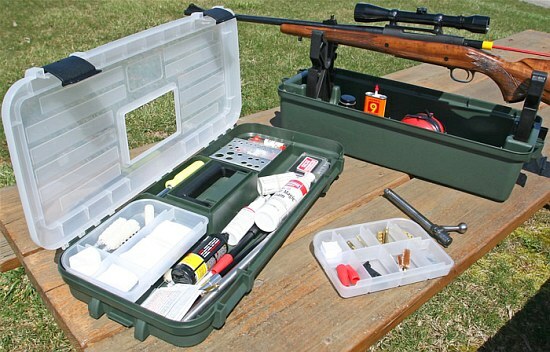 This Editor has used the MTM Range Box to clean rifles and as a “range expedient” rifle holder when adjusting scopes and tensioning action screws. It’s a good product that does the job and stands up to rough handling. The key feature setting MTM’s RBMC apart from most range boxes is the rubber-coated cradle system. Wide enough to fit a 3″-wide fore-arm, the cradles slide into vertical slots on either end of the box. This allows your range box to serve as a maintenance station. The RBMC is really pretty stable in this role, and the cradles won’t mark your stock. The cradles even feature slots on each side to hold your cleaning rods. 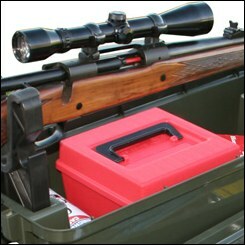 The MTM Range Box is secure enough to stay in place when you’re brushing the barrel. However, if you’re working on a carpeted bench top, keep one hand on the box when running a cleaning rod through the bore, just to ensure the box doesn’t slide. The MTM Range Box has two major components — the box base (with cradles), and a large upper tray with hinged top and carry handle. This large upper tray clamps securely to the bottom unit for transport. The top tray has a long section that holds cleaning rod guides, long brushes, grease syringes and the like. There are two, clear-plastic fitted divider trays. These will hold your patches and jags, plus comparators, ring wrenches, and other small tools. Though we really like the MTM Range Box, it’s not perfect. First, we wish the box was a bit deeper, to have added carrying capacity. The dimensions of the MTM Range Box are: 25″ long x 11.5″ wide x 8.75″ high. We’d like to see it 12″ high/deep to allow larger solvent bottles to stand upright and to provide more space to carry tools and shooting muffs. However, it is deep enough to hold the large 100-round MTM cartridge boxes that are popular with many shooters (see photo at right). While we like the twin clear plastic dividers that fit into the removable top-tray, but we wish the dividers had individual hinged tops. This would keep small items more secure. 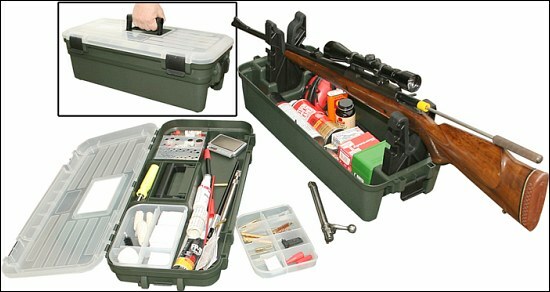 The MTM Shooting Range Box RBMC-11 (green version) is on sale now for $39.03 at Amazon.com, with FREE shipping. MTM also offers a black “tactical” version of this product for a bit more money ($43.93 at Amazon). This Tactical Range Box includes a special bracket that supports AR-type rifles through the magazine well. Share the post "Gear Review: MTM Shooting Range Box with Rifle Cradles"